The winners of the third Concours d’Elégance Suisse – were revealed at the award ceremony held on Sunday June 24th 2018 at the Château de Coppet near Geneva. Excellence, style, authenticity and the international automobile heritage were applauded by an international Jury which awarded 37 prizes and presented the 1939 Alfa Romeo 6C 2300 BMM with the Best of Show Award. 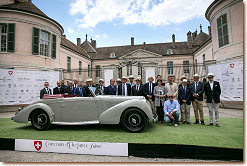 Under a bright sun, the competition at the Château de Coppet brought together 85 historic cars spread across 15 classes of excellence – all defined by the Chairman of the Jury, Adolfo Ordi Jnr, (member of the Jury of the Concorso d’Eleganza Villa d’Este in Italy) alongside the Honorary Chairman of the Jury, Ed Gilbertson (Honorary Judge of the Pebble Beach Concours d’Elégance in the USA). While the 60th anniversary of the legendary Aston Martin DB4 and the Ferrari 250 GT Coupe Pininfarina were appropriately celebrated by two dedicated classes and culminated in the top prize in the class being attributed to the 1960 Aston Martin DB4 series, the 1970s sedan sports cars also revealed excellent entries. The magnificent Hispano Suiza H6B torpedo convertible twin hood and the extremely rare Ferrari 250GT Berlinetta built by Bertone shone amongst the winning ranks. The E-Type Jaguar presented at the 1961 Geneva International Motor Show naturally stood out winning first prize in the front-engine sports coupés from 1960 to 1975. An extraordinary Lamborghini Countach LP400 from 1977 belonging to Simon Kidston, arrived like a glowing purple UFO on the lawns of the Château de Coppet and won the prize for rear-engine sports coupés from 1960 to 1977. It was nonetheless the long-awaited 1939 Alfa Romeo 6C 2300 BMM, built by famous Swiss coachbuilder Hermann Graber, that captured the attention of all and was awarded the Best of Show Award, the Concours’ highest distinction, presented by one of the main partners, Julius Baer private bank. This award recognises both the exceptional authentic aspects of the vehicle and the assessment of its original condition – on which pillars the entire Concours is based. The Concours d’Elégance Suisse ended after a highly successful third edition during which the three-day event was attended by more than 2,500 visitors. Being exhibited to both the jury, and to the public as of the morning of Saturday 23rd, the 85 cars threrefore arrived fromFrance, Italy, Great Britain, Switzerland, Belgium, Germany and Monaco as well as the United States and Thailand. They were assessed and marked by an international Jury consisting of 28 members from ten different countries, chaired as in other years by Adolfo Orsi Jnr, an emblematic figure in the Automobile world. The organising committee of the Concours d’Elégance Suisse and its Founder, Mathias Doutreleau, announced the fourth edition of the Concours which will take place from June 21 to 23 2019. Given to the automobile of the concours sold new in Switzerland or that has been under the same swiss ownership for more than 20 years.